And I think, having now been one for 51 years, I am permitted to say I believe prejudice and discrimination still sit, defeated, dormant, or virulent, somewhere in the soul of each white man in this country. I always must chuckle when I confront Keith Olberman types as their desperate ideology always circles the drain, down, down, repeat, flush, 2x - to the race card. I wonder if he is friends with Obama's minister - Rev. Wright? I wonder how many in the Obama administration agree with Keith Olbermann's assertion as well? He is an honored guess, don't forget. College campii? New York Times? Democratic party? Recall Olberman's proclamation during the Mass. election? Tim -Great post. I saw this after I did a post THIS issue. I went back and linked you at Rational Nation USA. Love your take! However, mine was less kind and perhaps more virulent. Olbermann deserves the lack of respect he gets. I think the left-wing folks in America truly believe they can interpret INTENT within human beings, and all they need to know is if there is an "R" associated with our politics. If so, regardless of our actions, they know that welling up within us is a murky soup of homophobia, racism and bigotry. The striking thing is that this intent only resides in those of us who haven't wandered down to the county offices to change our voter registration to something like Democrat or Unaffiliated. Until we do, we have no absolution; our intent remains dark, sinister and unclean. Keith Olbermann is an idiot; straight up! I think Keith Olbermann thinks his audience doesn't have any Caucasians. Is that possible has MSNBC become the CW of Cable News Channels? Keith Olbermann believes his audience is only made up of people of color? Remember Jesse Jackson and Al Sharpton got Imus fired from MSNBC, back in April 2007, and they did get people positioned at MSNBC. 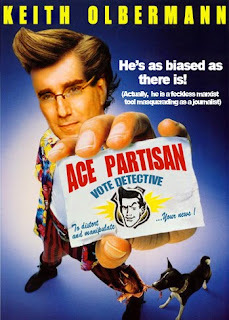 Could be that Keith Olbermann is just really, really aware of who is watching him, and what they expect to hear? If you look back to when Imus was fired - April 2007. MSNBC turned around, and hired Tamron Hall May 2007, and Christina Brown, June 2007. Tamron Hall came from the Chicago area, and probably got the position because of Jesse Jackson. Christina Brown, Las Vegas. They didn't stop at just getting Imus fired, they got people placed inside MSNBC. NBC, even hired a diversity leader. I think the media bunnies KO and Chris Matthews for example, Commentators for MSNBC, know exactly who is listening to them, and what they expect to hear them say. Remember Media Matters For America Monitor them. "All White People Are Inherently Racist, and Tea Party People Must Be Racist" It must really sux to work at MSNBC. Why MSNBC doesn't seem to care about ratings. They turned it into the CW of the Cable News Networks. MSNBC isn't intended for Caucasian audience? We all are paying attention to the very far left Liberal ideology but it goes deeper than that. I hope Comcast can do something for NBCU - about the strong arming from the Justice Brothers. Hey LCR, linked you at ABC on this.